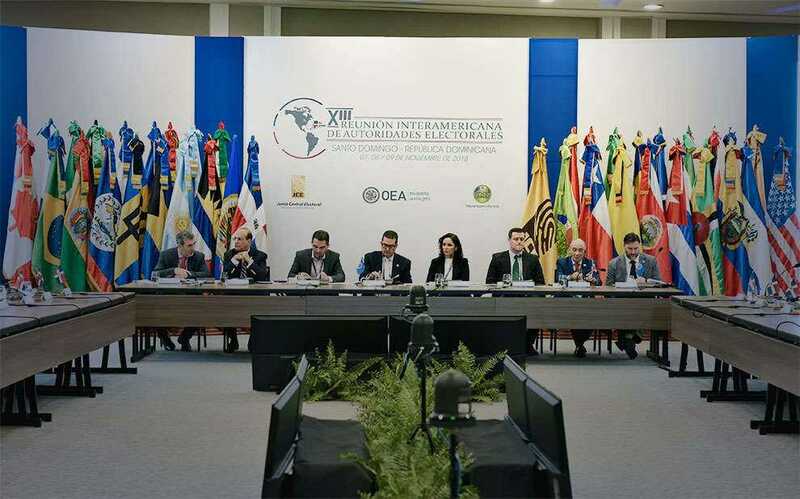 FGV’s Department of Public Policy Analysis (DAPP) participated in the “18th Inter-American Meeting of Electoral Authorities”, held by the Organization of American States (OAS) in Santo Domingo, Dominican Republic, on November 7-9. Researcher Thais Lobo joined the panel “Social media: How to ensure data privacy and freedom of expression when fighting misinformation?”, showcasing the results of the Digital Democracy Room – #observa2018, which monitored the public debate on several platforms during the presidential elections. “The meeting offered a privileged space for publicizing the research efforts undertaken by the Department throughout the election period, as the collected data concerning the political debate could be presented to agents directly involved in electoral processes. The flow of information on social media presents challenges to other countries in the region, and the Brazilian experience contributes with lessons on how to face them”, she said. The panel also included Ben Supple, Manager of Public Policy at WhatsApp; Jason Marczak, Director of the Atlantic Council’s Adrienne Arsht Latin American Center; and Edison Lanza, Special Rapporteur for Freedom of Expression of the Inter-American Commission on Human Rights (IACHR). The OAS’ Secretary for Strengthening Democracy, Francisco Guerrero, moderated the debate. The event also addressed topics such as challenges to effective female participation in politics; media regulation models for equal access; challenges in establishing spending limits in election campaigns; and the role of polls in electoral processes. Each panel was preceded by a presentation by experts, encouraging substantive discussions among the delegates. The purpose of the meeting was to promote the exchange of knowledge, experiences and successful practices in electoral administration in the region. The meeting facilitates horizontal cooperation in order to continuously strengthen the institutional capabilities of electoral agencies and further improve the way elections are conducted in the Americas.